People quickly navigate away from content that contains too many ideas. You can challenge readers without overwhelming them. So, once you craft a headline, turn that title into a question in order to pinpoint your main message. Then, as you draft and review your content, make sure every part of it answers that question. Length doesn’t matter. A short post could be cluttered and convoluted; a long post could be cluttered and convoluted. A long post could be clear and crisp; a short post could be clear and crisp. Even the busiest readers will make time for focused content, regardless of length, because they know they’ll get a payoff for their investment in it. What are the 7 unusual signs on the path to a breakthrough? How does this technique help you attract better clients and customers? Where is the best place to consistently find winning content ideas? So much writing advice fails to take into consideration that content marketers are people who have other responsibilities. And those other responsibilities sometimes make it difficult to see the obvious. I was distracted and needed to use this quick tip to move forward. Wouldn’t it be cool if there was already a checklist that could walk you through the steps of producing solid content? We thought so, too, so we created one. 🙂 It’s a small but mighty resource to help you click Publish with confidence. Our Content Confidence Checklist lets you check off the most important elements of good content, so you know you’re producing your best work. Because even when we know what to do, we have to remember to do it … every time. Previous article: Welcoming Our New Students to the Creative Foundations Course! You could combine the above strategy with the Pyramid Principle of Barbara Minto. Take the key point, split it out, then further. Build up a bullet list of points, then turn it into a text. That’s the way I like to do it. Probably a bit engineering style, but it works. Focus is such a valuable commodity and skill to learn! It’s about so much more than just sitting down and scribbling out something. Taking the time to guide your creativity into an intended message is an excellent habit to put into place. Even though we all have busy lives, there is definitely time to develop writing and organizational skills. Great post! These are great strategies. I like to take a few minutes when I first sit down and jot down thoughts on my topic. Seeing all my ideas on paper helps me focus on the true message and write more concisely. The concept of asking yourself questions whey trying to fight through writer’s block isn’t a new one. I the last few weeks, I’ve read at least half a dozen books and/or blogs that use the same technique to fight writers block. What I did like about this posts here is that is uses a real-life example. Most of the books or blog posts that I’ve read didn’t point to an actual article that they had written before to show exactly how they used the techniques. In fact some of them, usually the books, simple quote what another authors said about the subject. The blog posts, simply reference another blog post. So kudos for that. It was nice to see exactly how you pulled this one out using another blog post that you have written. 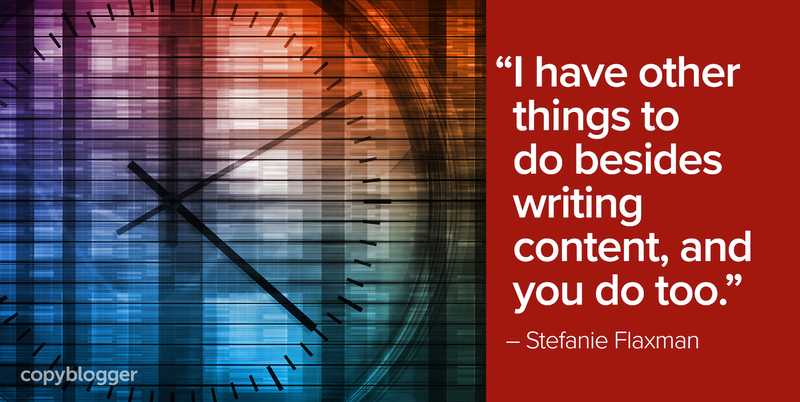 Thanks, Stefanie for such a useful post! Asking yourself questions is a proven way to keep your story going. And you have explained it well. Thanks, again. What helps me is to put the content aside for overnight at least but even for 2-3 days is good. You’ll come back to it with new thoughts and your brain has even sometimes been processing it in the background. More research also helps because you get to see what others might say about a topic and you can build on their ideas from your own perspective. This is a perfect application of the KISS formula. I printed it out and posted it on my “writing tips” board (which is high praise because the board isn’t that big). I appreciate that this post earned a spot there, Craig. Thank you for sharing this. I’ve just began implementing it in my blogging and I have high hopes it will work. There’s always that temptation to end a blog post when ideas run dry when there is actually something meaningful to add. After all, there are no prizes for clicking the publish button sooner. I have to use this principle in academic writing. I need to formulate research questions before I start an article or a paper, and I need to keep coming back to them to make sure I don’t wander off on a tangent. So no matter how much I love the comedy in What We Do in the Shadows, if I’m looking at set design then I can’t talk about it! So it helps me stay on the topic. I honestly don’t know why I never thought to apply the same principle to blog content! It’s a time-saver for sure!